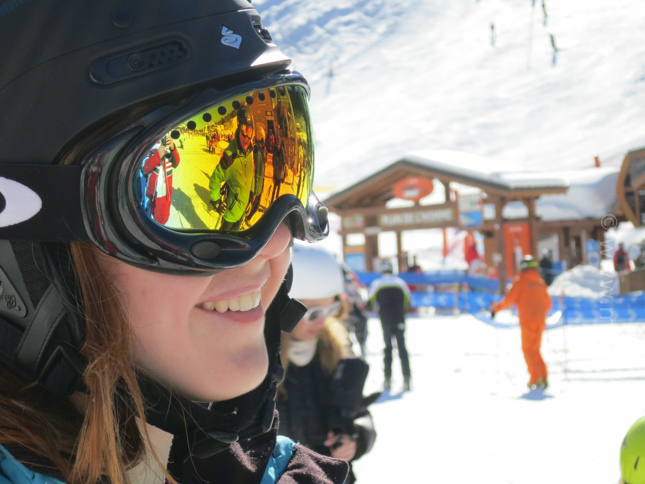 Last week saw the start of the school holiday period here in Meribel, with the first week of the French holidays, and the main British half term as well. 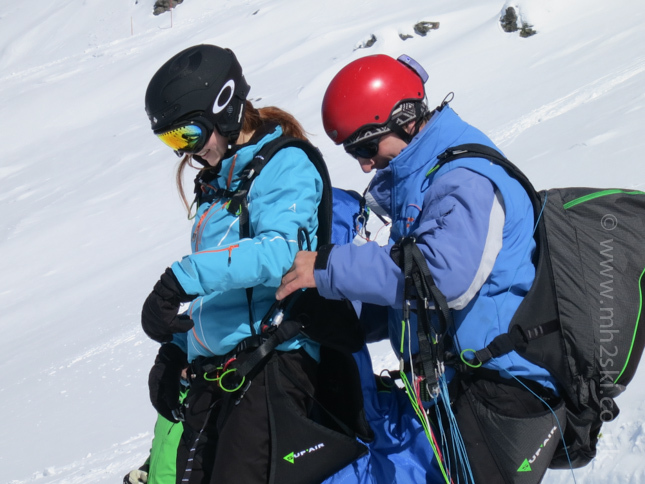 Ski instructors often have these weeks booked far in advance, with Michael and I being no exception. 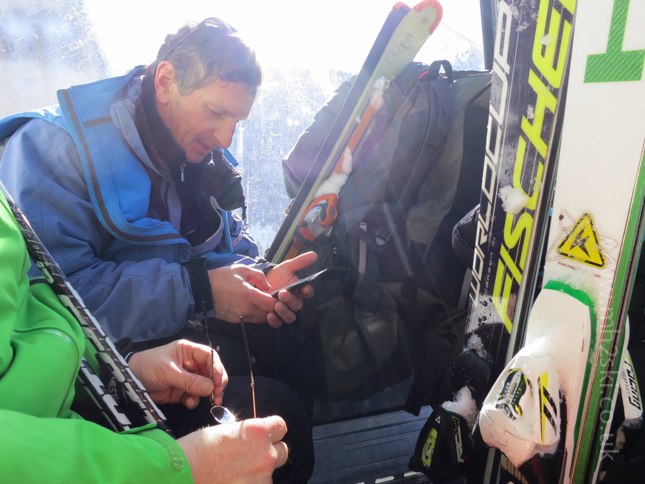 For several years I have had the pleasure of skiing with the Joneses and trying to keep up (! )with them. The snow conditions are now absolutely fabulous, and the weather behaved itself on most days. 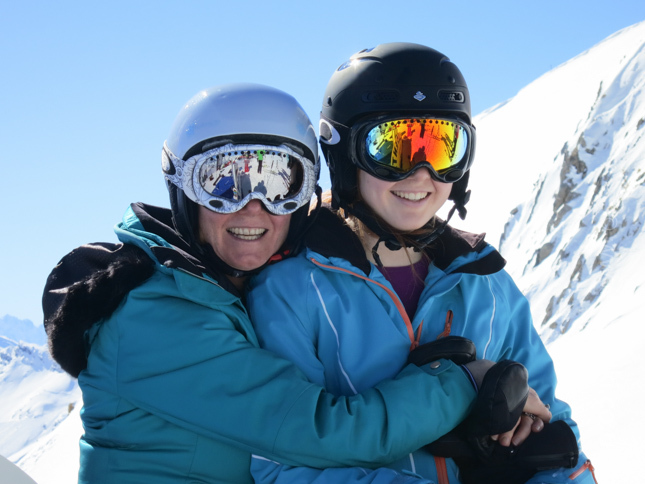 Half term week is a great opportunity for families to be together on snow, and this was certainly the case for the Joneses. There was an extra twist last week as well. 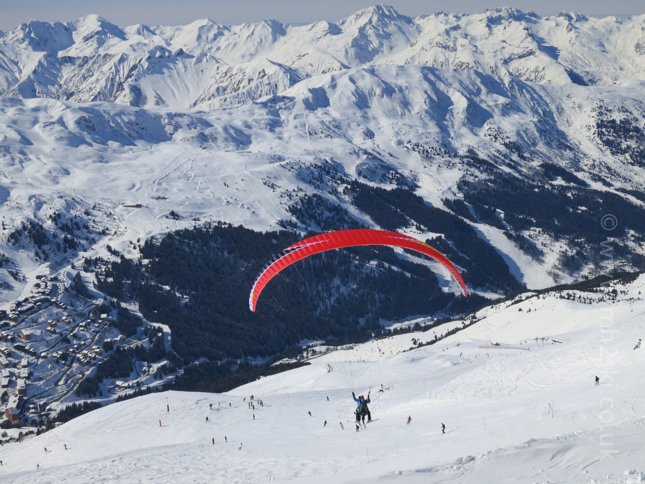 A Christmas present for Olivia from her parents: a parapente flight from the top of Saulire, to be taken anytime this winter. So last week Helen and Chris, her parents, kept a close eye on the weather forecast and booked her flight for Thursday lunch time. 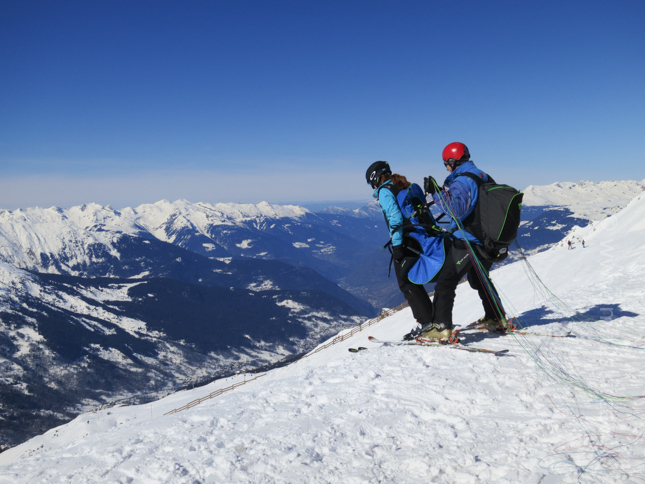 We all went up to the top of Saulire for the rendezvous and met Olivia's pilote from the TandemTop organisation. We were all introduced to Stephane Drouin, one of the most relaxed and calming of chaps I've met on the mountain this winter. Stephane is a bit of a parapente superstar. 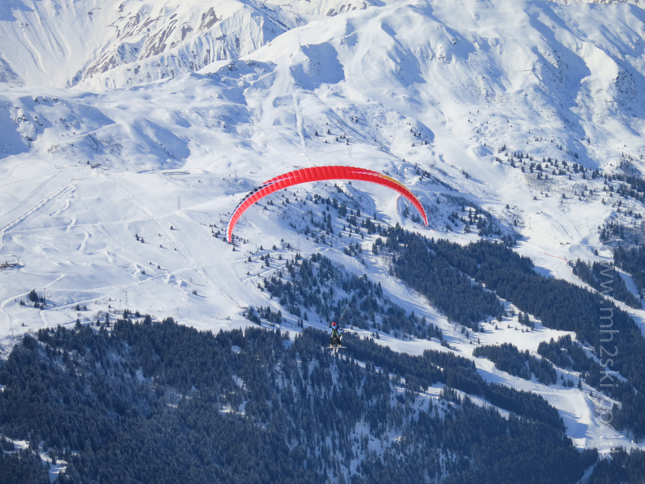 He has only just returned from the Parapente World Cup circuit in Brazil at the end of January, where he was part of the successful French Team. This of course is all very reassuring in terms of having confidence in his ability to fly safely. 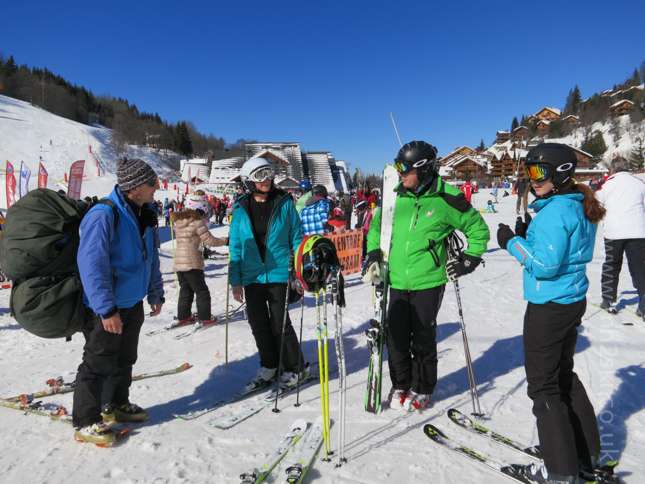 He guided us on skis to the take off point, which is about a hundred metres from the piste. He swiftly laid out his canopy in preparation for take off, and checked, double checked and triple checked all of his equipment. Meanwhile Olivia was getting ready in her own manner. Now you see, most people I would imagine would start to feel a little nervous at this point. Did Olivia? Not one bit of it. She was as excited as an excited thing on an excited day !?! Just before take off Stephane explained how long the flight would last and he also mentioned there might be the odd surprise! 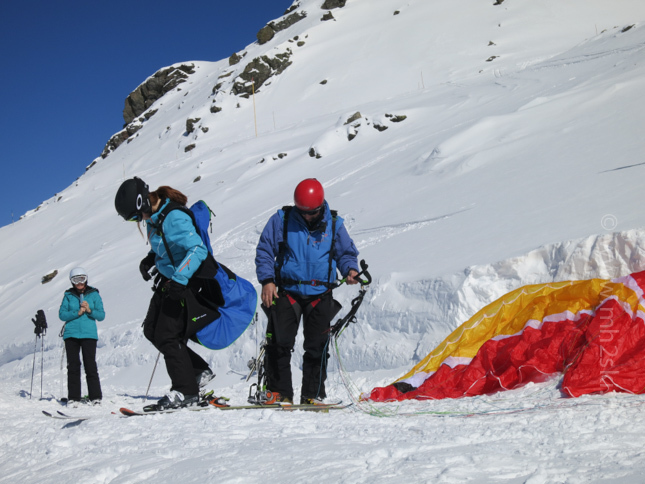 He then stated where they were going to land, which was just next to the Truite green piste between Meribel Mottaret and Meribel. Chris, Helen and I were to aim to ski down to the bottom of the Saulire Express at a similar rate of knots in order meet up with Olivia after the flight. A final check, double check then triple check and they were off over the edge, to a muffled shriek of delight from Olivia. We stood at the top of the mountain for a few seconds in awe as they floated away. It really was quite impressive. However Chris soon said "Ok guys, we'd better get going, the chase is on". 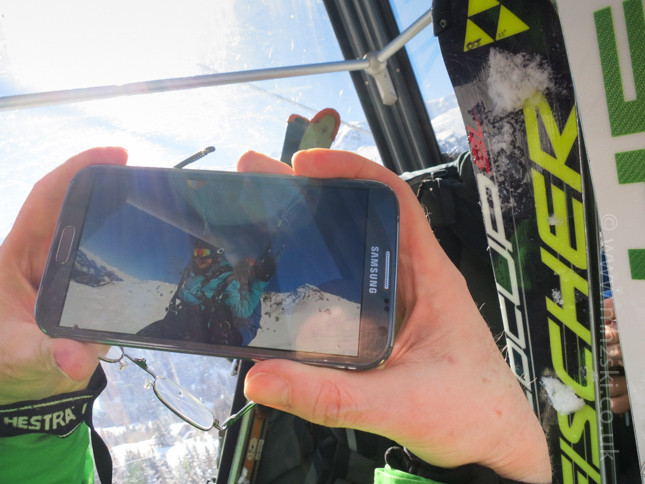 We clicked on our skis, put our cameras away, and re-joined the piste. We stopped a few times on the way down to Meribel in order to get our breath, but also to see if we could catch sight of Olivia and Stephane in the sky. A couple of times we were able to see them before they disappeared. 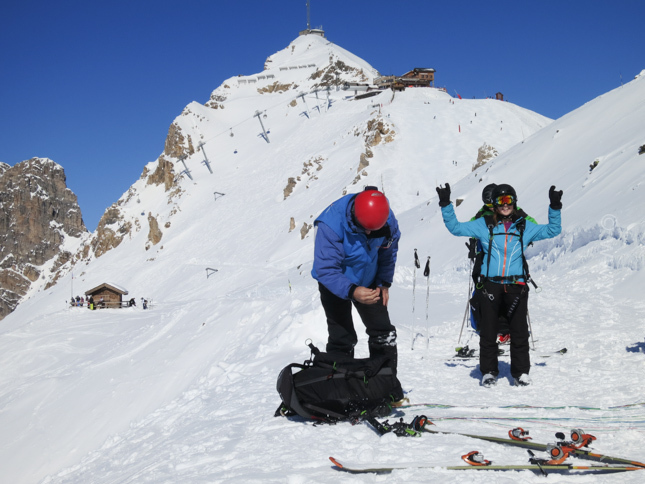 Just moments after we arrived at our rendezvous point down at the Saulire Express bubble, Stephane and Olivia slid up to us both with great big beaming smiles on their face. "Oh my God, it was like.... like soooo amazing" stated Olivia. We had a quick chat before all five of us, including Stephane's huge parapente, squeezed into the bubble to return back to the top of the mountain. It was here that Stephane produced another surprise. We didn't realise it at the time, but he was able to take photos and video recordings during Olivia's flight, and was able to show us in the bubble on his mobile phone. How cool is that? This is one photo he took just before coming into land. Thanks to Stephane and the Joneses for the use of this photo. Don't forget you can click on this image to enlarge it. 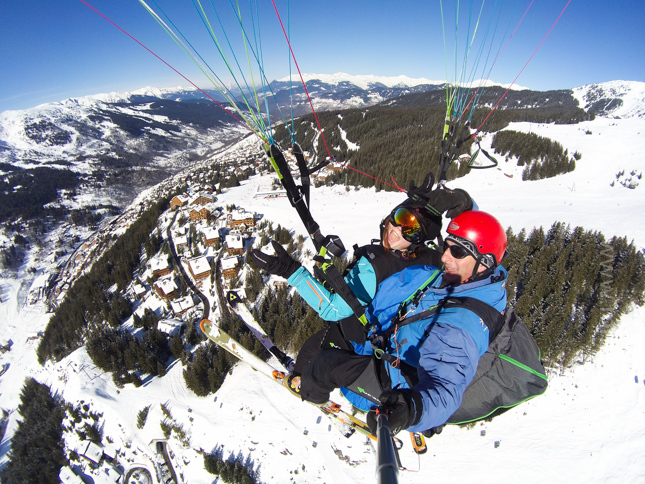 If you are coming to Meribel in the future and fancy taking a parapente flight, then do consider TandemTop, you can view their website by clicking here. If you enjoyed this bog post, you might like to see an article written over another holiday period titled 'Cosmopolitan Festivies'. Feel free to share away on Facebook, Twitter and Goggle+ by clicking on the social media buttons. Or you can leave a comment below. Oh, before I disappear for another week, thought you would like to know that the snow conditions continue to improve yet again with further snow falls due at the end of the week. Martin.